I want to be part of a Blue Zone. What is a “Blue Zone,” you ask? 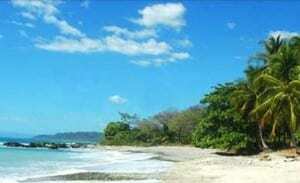 It is a place where people live happily and healthily for a very long time. The term was popularized by author-educator-explorer Dan Buettner in his 2008 book, “The Blue Zones: Lessons for Living Longer from People Who’ve Lived the Longest.” Published by the National Geographic Society, Buettner identified places in the world there is a high concentration of persons over age 100, and there is a substantial disability-free and disease-free life expectancy. Why are they called “Blue Zones”? The name comes from a 2004 demographic study called “Identification of a Geographic Area Characterized by Extreme Longevity in the Sardinia Island: the AKEA study” (Experimental Gerontology by Gianni Pes and Michel Poulain, among other authors). 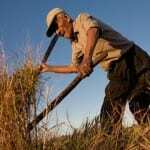 The study identified Sardinia’s Barbagia region as an area with a very high concentration of men over age 100. As the authors discovered more clusters of long longevity in the world, they began drawing blue circles around them on maps, referring to the areas as “Blue Zones.” To my delight, Costa Rica has its own Blue Zone – the Nicoya Peninsula! According to Buettner’s studies, the Nicoya Peninsula has the world’s lowest rates of middle-age mortality and the second highest convergence of male centenarians. Costa Rica indeed does celebrate its elderly citizens; every person who has a 100th birthday is featured on the national news. As of June 2012, our tiny country reported 417 citizens over the age of 100; the country’s official population is more or less 4.5 million. 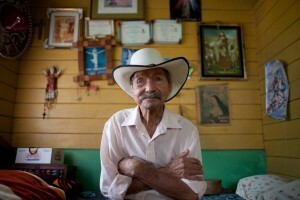 Costa Rican Photographer Mónica Quesada is creating a book and video documenting Ticos who have lived a century. More information at www.indiegogo.com/CRCentenarians. Buettner’s research with National Geographic also turned up longevity hotspots in Okinawa, Japan; the Aegean island of Ikaria, Greece; a Seventh Day Adventist community in Loma Linda, California; and we already know about the mountainous Barbagia region of inner Sardinia, off the western coast of Italy. So what’s the secret? 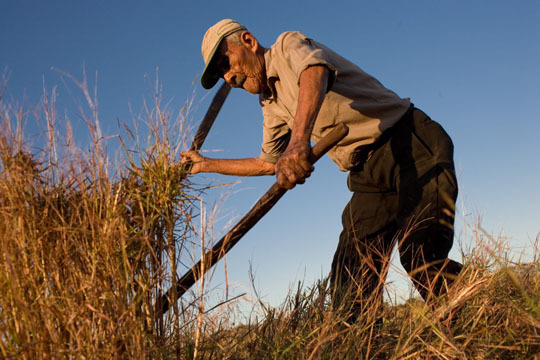 Buettner’s team of researchers and specialists found interesting similarities among the Nicoyan centenarians that are common characteristics in all of the other Blue Zones: . Have a “plan de vida,” or reason to live; it also can be called “why I get up in the morning”. Centenarians say they feel needed, with a sense of purpose that often centers on their family. Focus on your family and friends. Having a good relationship with their family and maintaining a strong social network contributes greatly to centenarians’ sense of purpose and well-being. People of all ages are socially active and integrated into their communities. Have Faith. The Nicoyans’ strong belief in God and their “faith routines” help relieve stress and anxiety. Almost all of the centenarians interviewed around the world for Buettner’s book belonged to a faith-based community of some form. Work hard. Nicoyan centenarians maintain a strong wo rk ethic, which keeps them active and healthy while contributing to their sense of purpose. Moderate physical activity is a normal part of daily life – walking, bicycling, gardening, cooking, keeping up the house, taking care of animals, etc. Get some sun. Nicoyans enjoy healthy doses of daily sun, enriching their bodies with Vitamin D. Getting at least 15 minutes every day can decrease the risk for osteoporosis and heart disease, experts say. Get Sleep. Nicoyans sleep an average of 8 hours per day. They more or less go to sleep soon after nightfall and wake with the sun. No smoking. Smoking is not common in Blue Zone communities. On the Nicoya Peninsula, a place dedicated to healthy life is Pranamar Oceanfront Villas & Yoga Retreat. 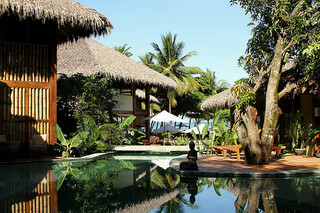 The intimate, boutique hotel at Santa Teresa Beach centers on daily yoga classes and regular yoga retreats, surfing, beautiful nature and no-stress relaxing. Pranamar’s Buddha Eyes Restaurant specializes in organic and fresh cuisine, using local fruits, vegetables, fish and seafood. The hotel’s motto offers you to “step into the rhythm of nature, breath in the energy of the sea, and discover.” Pranamar Villas is a TripAdvisor Travelers’ Choice and Certificate of Excellence winner for 2012. Plan your vacation today to Pranamar Villas, in the Blue Zone of Costa Rica’s Nicoya Peninsula, and get in the healthy rhythm of Blue Zone living!